Democratic presidential candidate who lost Senate race to Ted Cruz says PM Netanyahu not a valid negotiating partner for peace talks. Former Texas congressman and 2020 Democratic presidential hopeful Beto O’Rourke, whose 2018 Senate bid against incumbent Ted Cruz drew nationwide attention, blasted Israeli premier Binyamin Netanyahu, accusing the Israeli leader of “openly siding with racists” and using anti-Arab demagoguery in the 2015 Knesset election. Speaking at a campaign event in Keene State College, a liberal arts school in New Hampshire, O’Rourke suggested that the Israeli premier could not serve as a negotiating partner for final status talks with the Palestinian Authority, comparing Netanyahu unfavorably with PA chief Mahmoud Abbas. 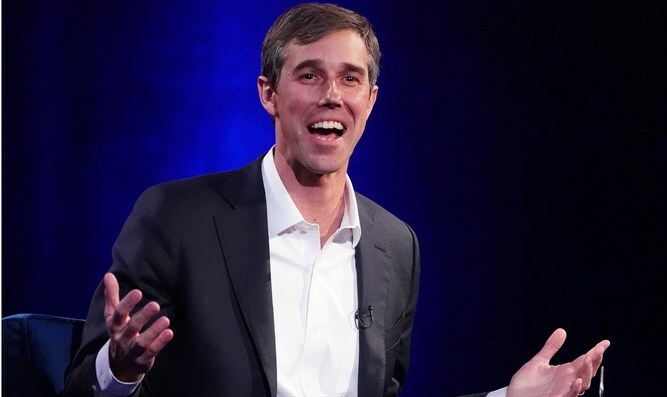 O’Rourke referenced Netanyahu’s support for a deal to bring the right-wing Otzma Yehudit party into a temporary alliance with the Jewish Home party, forging a joint list to ensure that both factions enter the Knesset. The former congressman, who recently announced his 2020 presidential bid, also hit Netanyahu over the Prime Minister’s comments during the 2015 Knesset election, in which the Netanyahu warned of heavy voter turnout for the radical anti-Zionist Arab Joint List party. “In Israel, we have a Prime Minister who openly sided with racists, who in a previous election warned that the Arabs were coming to the polls. And on the Palestinian side you have an ineffectual leader, Mahmoud Abbas. He hasn't been very effective in bringing his side to the table either." On election day in 2015, Netanyahu warned that his “right-wing government is in danger. Arab voters are heading to the polling stations in droves,” adding that “left-wing groups” of “busing in” Arab voters to boost the Joint List faction.